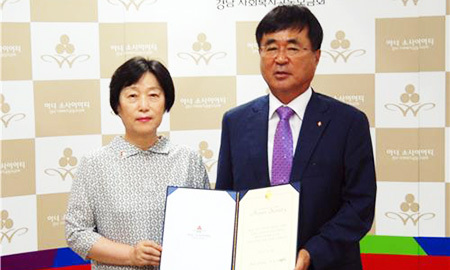 (P1) Retiring policewoman Park Soon-ja has joined the “Honor Society” for donating 100 million won ($87,000) to a local welfare center in Changwon, South Gyeongsang Province. The honor is bestowed upon those whose donations surpass 100 million won by the Community Chest of Korea, the largest nonprofit welfare institution in Korea. (P2) The 61-year old outgoing superintendent said she owes a debt of gratitude to society. (P3) Park served as a police officer for 37 years. She first joined the Masan Jungbu Police Station as a constable in 1979, one of the few female police officers at the time. (P4) Having served various posts including the 112 emergency control center and the female and juvenile divisions, she has spent most of her career dealing with people’s requests. (P5) Last month, Park officially retired from her post at the Changwon Seobu Police Station. (P6) While serving as a police officer, she regularly visited local senior welfare centers to perform various volunteer efforts such as bathing those with serious illnesses and washing their clothes. (P8) Park is the 80th Honor Society member in South Gyeongsang Province. Would you consider donating your severance pay to charity? Why or why not? Why do people donate money to charity? Besides money, how else can people donate? Who did she give the money to? What was the title of her last position? In which year did she start her career? Which organization is she a member of now?